Mmmmhmmm. You know I love food, and when there's food trucks involved, I'm in. A couple weeks ago, I found out about this neat event through Sharon's blog, Only Here For the Food. With her partner in crime, Mack, they decided to host an event with some of Edmonton's food trucks, in hopes to mimic a food truck event they attended while visiting San Francisco. 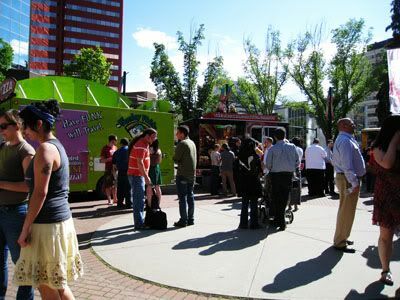 The aim was simple: bring some life and vibrancy back into the downtown core of Edmonton, and encourage Edmontonians to come out and enjoy the weather & good food! 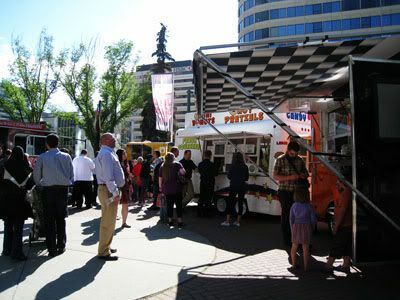 While I am aware that Edmonton's food truck scene is well, not quite existent, I was still excited nonetheless. 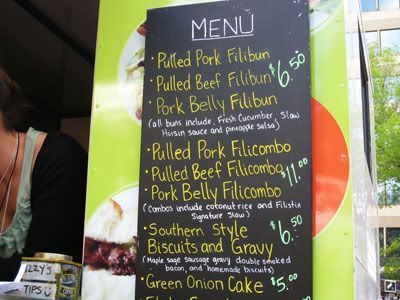 Their lineup was promising, with seven different vendors: Carnival Cravings, Eva Sweet, Fat Franks, Filistix, The Fork and Spoon Brigade, the Funky Pickle & the Lingnan. The unfortunate downturn for me was that I had to get to work at 6:00 pm! I headed downtown with my boyfriend, and with Friday afternoon rush hour traffic, we didn't get down to the park until about 4:45.. giving us approximately 30 minutes to pick and choose what we wanted to eat. 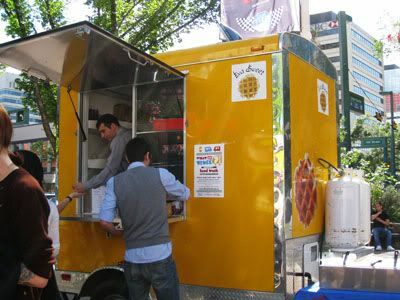 I ended up choosing a liege waffle from Eva Sweet, and I regret not having two!! This was one of the best waffles I've had in a really long time. 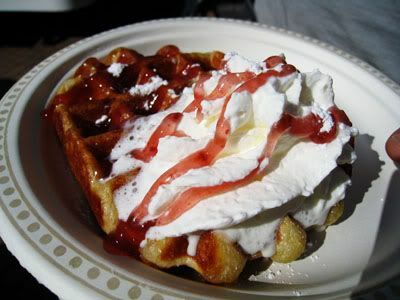 For $4.50, I received a warm, soft, fluffy, caramelized waffle topped with whipped cream and raspberry sauce. So. Good. I was so excited and ate half of it before I realized there was fresh fruit for it too! Whoooops. 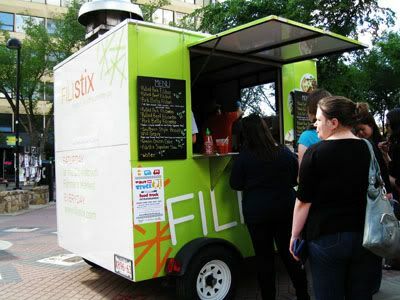 Next up, Filistix. This little truck usually sets up at the City Market on Saturdays to serve patrons fusion food in the style of buns and biscuits. Not only did this vendor have the longest line, they also had the longest wait before receiving their food. I don't think they were expecting such a great turnout at their truck - with a wide variety of items to choose from & two people running the truck, I think they were a little overwhelmed! But still, everyone waited patiently for their orders and the guys were very friendly :) I went with the Pulled Pork Filibun, and waited about 15 minutes before I held it in my hands. 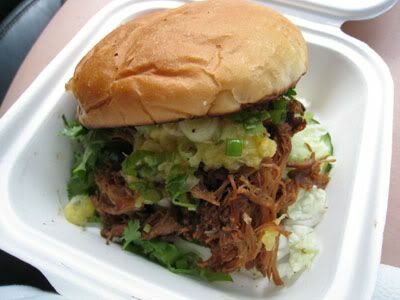 Slow braised pulled pork, pineapple salsa, cucumber, slaw and cilantro was wedged between two grilled bun faces.. it looked really difficult to pick up and eat! The food inside was on the cooler side, making it not as appetizing for me. It would've been so good if the meat was still hot! The flavours were great together, but I couldn't pick it up. I ended up cutting it up like a lady, with my fork & knife. I'd say this event was a huge success! There was a great turnout, and the weather was being cooperative. A big thanks to Mack & Sharon for organizing this event.. I hope to see another one in the future with more trucks!